It has come to my attention that a handful of astute grammarians at the LA Times have taken issue with my definition of “passive voice” in this post. The article’s author skewers this very post with delight, and mistakenly calls this a grammar blog. At this point I think you faithful readers fully understand this is a blog dedicated to helping writers elevate their story craft, not to offer a grammar lesson. My blog discusses prose in service to the story and characters, about passive vs. active writing, and when to use which. For example, forms of the verb “to be” vs. active verbs and the impact each delivers in the written work. So if you go read her post, come back and I will explain something that she brings up. Rather than merely the object of a sentence appearing as the subject of it — “The land was overtaken by heathens” — our purpose here is different and goes deeper. So I can only laugh that LA Times Jane was fit to be tied by this. She certainly didn’t seem to dig very far into the focus and topic of MaloneEditorial.com before she attempted to skewer my post. Then again, she’d roasted both J.K. Rowling and me, so I’m in good company! That pesky passive voice. It slips in when we least expect it. Have you ever wondered why? Because, well, we tend to think and talk that way, so when in the throes of writing, it comes creeping out. We’ve all made this transgression, no? Now, I’m not saying that we need to avoid all forms of the verb ‘to be’ (even though not all forms of the verb constitute passive voice). Not only is doing so impractical, but places exist when passive is called for. But imagine the effect if you use that voice when you intend to—to slow down the narrative, or for effect. As you already know, stories have an ebb and flow to them. When you’re writing a car-chase scene (or any version thereof), we want the prose to be active, which moves the action along. Then when writing the consequences of that scene (the time for reflection about what the heck happened), slowing down the pace with passive voice works great! Most aren’t writing in the vein of Dickens these days, however, and we could speculate all week as to the chances for this being published in modern times. But especially in genre fiction of all categories, active voice is called for (if not required). So how do you slay the passive? A few tried and true ways sure help. 1). Think of choosing more active verbs in place of all your ‘was’ constructions. As a quick example, rather than, ‘The noise was terrifying,’ write, ‘A booming roar filled the air.’ This subtle difference makes an enormous impact on the read. Basically, you’re just turning the sentence on its head. And every bit as important, this evokes the sound as well. So you’re hitting two ducks with one shot. 2). Avoid Passives + Participles. If an action is truly ongoing, ‘was walking’ is fine. However, ‘walked’ almost always works better. The latter invokes stronger, more active images. And keeps the prose moving. 3). Catch all of those ‘It was;’ ‘there were;’ constructions. Again, unless you’re writing Literary, or copying Dickens, be highly suspicious of any sentence beginning with or containing this structure. Not only is it slow and cumbersome, but it produces two main effects as well: A. It is often difficult to tell who or what it is and what it is doing. Basically, it is confusing. And B. It is very telling, rather than creating, showing, portraying, etc. You can use this construction, but do so deliberately—when you want to slow down the narrative, or for effect. Dickens did it pretty well, don’t you think? 4). Avoid passive phrasing such as ‘made her way’. Not only is that construct slow, but also very telling as well. Show how she made her way–trudged, inched, ran, etc. Get some emotion in there based on the verbs you choose. 5). Avoid all passive voice while in action scenes. Just as stories have that ebb and flow to them, so does sentence structure. And remember—everything is in service to the plot or characters or hopefully, both, including every single word. Here most of all, we want the prose to move. We want it crisp, sharp, staccato to invoke the action/panic/fear, etc. See, that wasn’t so difficult, was it. 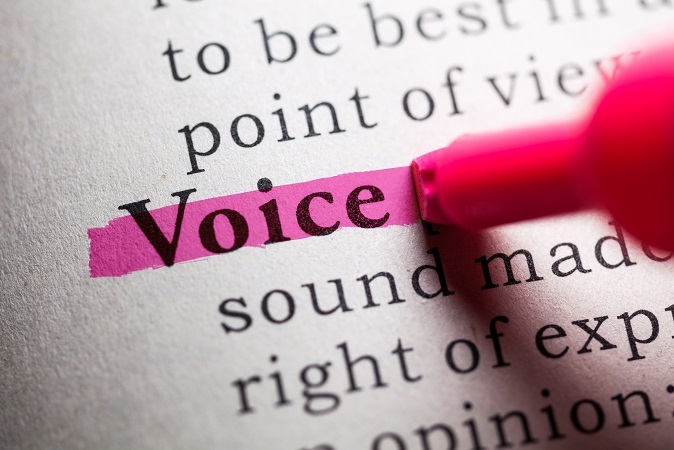 How do you get passive voice out of your writing? Passive *voice* is a grammatical term that refers to a particular verb construction which has this form: [a form of the verb ‘be’] + [past participle] (‘past participle’ = the -ed form of a verb which is irregular for some verbs, like break/broken). The post *is delivered* in the morning. I’m *being eaten* by mosquitoes. I’ve *been robbed*. The window *was broken* by a ball. They deliver the post in the morning. Mosquitoes are eating me. Someone has robbed me. A ball broke the window. If you want to talk about passive *writing* in a stylistic sense, I’d suggest just stick to some term like ‘passive writing’. To use ‘passive voice’ in this sense invites confusion because it already has an established grammatical meaning. Anyway, I don’t think it’s a particularly better or clearer term than just saying ‘passive writing.’ ‘Voice’ is rather opaque, even for the grammatical meaning. Thank you for your thoughts, and for stopping by! Active writing influences people more than passive voice writing.